Spotted in todays' Metro. Presume you need a 10 quid top up too so I've added that. Best price for a 710 I've seen! Free Monster earphones. Valid on purchases between 1st-30th June. Why is it everything I seem to buy these days comes down in price almost straight after? Cracking price for a nice bit of kit. Why is it everything I seem to buy these days comes down in price almost … Why is it everything I seem to buy these days comes down in price almost straight after? Cracking price for a nice bit of kit. I know the feeling! We got this for my missus on the old deal last week. Ah well. I cant see this on their website. I know the feeling. I got this phone when it was priced at £150. That's a really great price. Do you think it will be available nationally? Or just to stores in London (I'm guessing from the fact it's in the Metro)? That's a really great price. Do you think it will be available … That's a really great price. Do you think it will be available nationally? Or just to stores in London (I'm guessing from the fact it's in the Metro)? Metro's not just in London as we have it here in Bath. I guess different adverts may be printed dependent on locality though? Is it right this has very poor battery life? The battery is not great, but if you tweak a few things, such as auto brightness, turn off unnecessary updating, don't leave stuff like Wifi and Bluetooth on all the time, it is okay. Not great but manageable. I wouldn't let that put you off though, this phone was a good deal at £150, at £100 it's a steal. Will take the metro in, the wife is looking to ditch her acer liquid metal, and TBH it is terrible, the curved screen is terrible and not responsive. Metro's not just in London as we have it here in Bath. I guess different … Metro's not just in London as we have it here in Bath. I guess different adverts may be printed dependent on locality though? Battery life is fairly decent. So this is available in all cw stores today? Does it really expire before it starts? Eh? Set it as starting today and expires June 7th like.it says on the pic? .... so this or the Hauwai g300? I think I'm gonna get this. I already have the Titan but price, Nokia drive and other exclusive apps are too much of an attraction. Added it into the OP. Cheers mate! .... so this or the Hauwai g300?Any advice please? I also noted although not guaranteed the G300 would get ICS if not official then Modaco; whereas the 710 is high unlikely to get W8 when that releases later in the year. Had the G300 a few days and happy with product and OS (Came from Blackberry OS so no surprise I guess (_;)). Got one in cardiff high street, sweet!! just need a sim card cutter. The prices on these 710's have been dropping like a stone for weeks now! Gotta be because the 610 has just launched and the inevitable new batch of Windows phones with the new W8 operating system..Plus the fact no hotspot on these 710's for tethering and very little support in the way of apps in the Nokia market and apps cost is expensive from Nokia, the only good thing this has going for it is good screen and offline satnav! This is an excellent find!!! Was torn between this nd the HTC radar a few weeks ago, but after a play with both in their respective stores definitely glad i went for the radar! HTC build quality is excellent, Battery life fantastic for a smart phone and the speed of the radar phone for the price! The prices on these 710's have been dropping like a stone for weeks … The prices on these 710's have been dropping like a stone for weeks now!It'll be £89.99 next weekGotta be because the 610 has just launched and the inevitable new batch of Windows phones with the new W8 operating system..Plus the fact no hotspot on these 710's for tethering and very little support in the way of apps in the Nokia market and apps cost is expensive from Nokia, the only good thing this has going for it is good screen and offline satnav! Yes but if you have a girlfriend that only wants it for facebook and email and internet while they are at home or general browsing this is a good deal, and had a play in cpw with it and it was very responsive, as much as my evo. so good enough for her. I thought the software update rolled out? If you just use it to get emails and to send a few texts and calls I got a full day and a half usage out of it which i thought was cracking. However playing games on it and listening to music gives me about 18 Hours tops of usage. Obviously not open to the ideas of Windows Phone, I've got a SGS2 and now running the Nokia 710 as my work phone, the 710 interface and responsiveness is far more consistent than my S2 running ICS. Also another point is that the Lumia 710, 800 and 900 all use the higher spec 1.4Ghz processor which is actually part of the Windows 8 requirement build for handsets, the Lumia 610 will not get upgraded it has only 256MB of RAM and the slowest processor 800Mhz. For the price this remains to be the best phone value for money wise. This might be a silly question but what qualifies for a prepay upgrade? 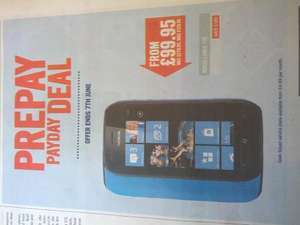 Currently in a contract but still over a year left on it..... Also on Three so do carphonewarehouse stock Three Lumia 710's? Small Bonus, if you get it with an Orange PAYG sim you will get 250MB data allowance every month for the 1st year... I've thrown that sim in my iPad and it works a treat ;o) and no you don't need to add any top up for this offer!! For the upgrade price, is any top-up required on top of the £89? i believe it's for if you're on PAYG and have had an active SIM for 6+ months for prepay upgrade. could be mistaken though. The 710 never got the upgrade, people are still waiting on whether the 710 will still actually get it! I done massive amounts of research on the net and in forums and blogs before deciding it was too much of a loss leader to put my money into and went for a HTC in the end! Brilliant phone though if you have a girlfriend who just uses it for texts calls and facebook and not much else! Deal posting newbie! This is krogothnx first deal post. Help out by leaving a posting tip or just to show your appreciation for their contribution.